Every year BBC Gardeners’ World Live presents a number of varied and inspirational show gardens. Beautiful Borders, the five APL Avenue show gardens and the large show garden categories are all popular with visitors. This year sees the celebration of 50 years of BBC Gardeners’ World on BBC2 and the show will be marking this milestone at the Show with two special anniversary gardens designed by Paul Stone and Professor David Stevens. 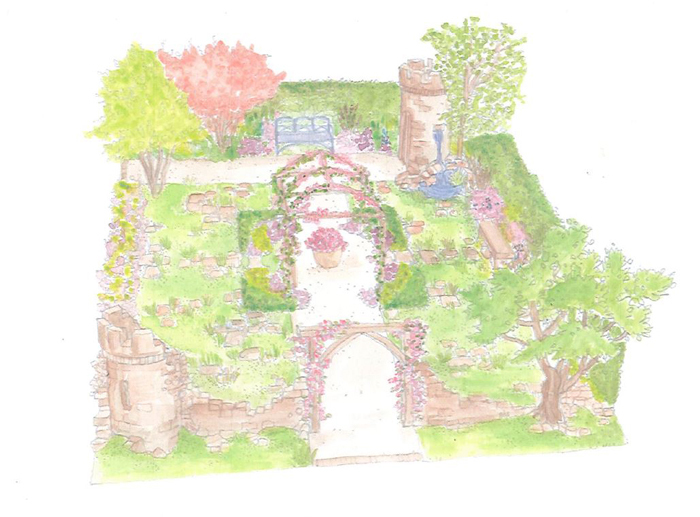 In the large show gardens category, ‘Wyevale Garden Centre’s Show Garden‘ will feature a garden designed by Claudia de Yong Designs (pictured above). 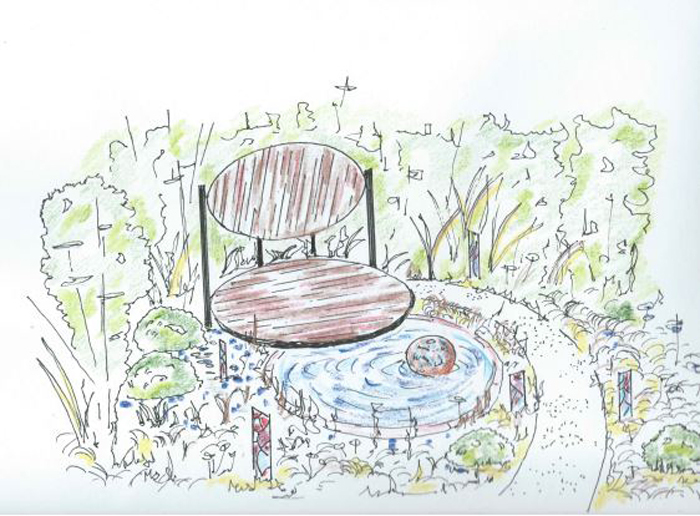 Last year, Claudia’s garden in the APL Avenue category created a lot of interest and one feels that her design for Wyevale, this year, will be one of the show garden highlights. Claudia has designed a garden evoking scent and romantic creativity. She has created elements that can be recreated at home and it will have the special added attraction that visitors can walk through to experience the garden close up and take home inspiration for their own gardens. Tesco are sponsoring the ‘Every Little Helps’ garden, (pictured banner at top of page) designed by Owen Morgan, Mosaic Gardens. 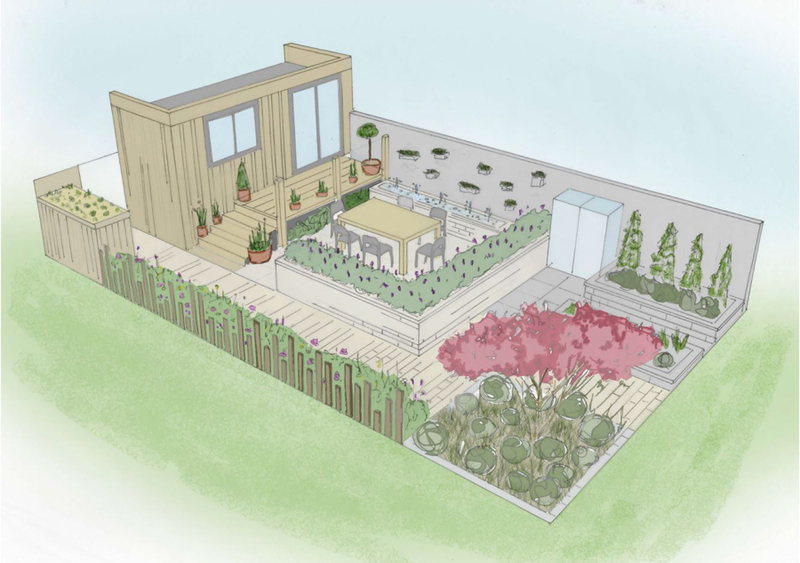 Tesco, in partnership with Intergreen, will present a garden inspired by small spaces, an interactive garden offering lots of little helps and inspiration to help you grow flowers and vegetables in small spaces. Owen has designed a number of show gardens at BBC Gardeners’ World Live, winning a Gold Medal and Best in Show at the event last year. 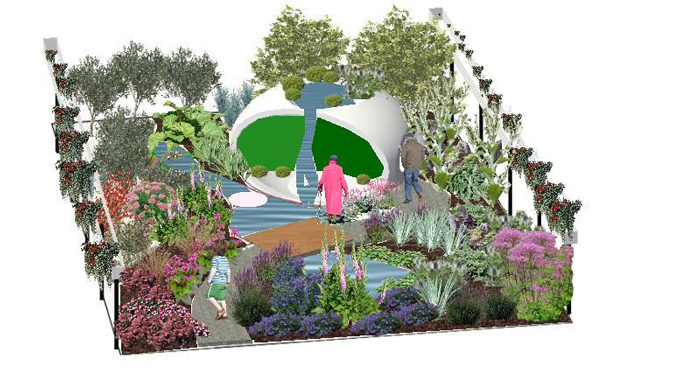 The MS Society garden – ‘Journey to Hope’ – is designed and built by Derby College (pictured above). The garden holds no punches in its design which represents the journey of those as they come to terms with MS diagnosis and its life changing effects. The central bridge will represent the often devastating point of diagnosis, but the structure of the bridge will demonstrate the often hidden support of many who help MS suffers through this stage. The garden has a retreat ‘pod’ and curtain waterfall to aid reflection and mindfulness. ‘Serenity’ designed by Andy Tudbury, Halcyon Days Garden Design, (pictured above) is a place to relax and unwind, providing calmness through planting and ripples on a pool reflecting feelings of serenity. A place to leave the worries of the day behind and absorb the spirit of the garden. GreenThumb’s ‘With a Twist’ garden, designed by Pip Probert, is a stunning feature stand garden. Pip returns for GreenThumb after her success last year, and so we can be sure that ‘With a Twist’ will have the WOW factor. Visitors can also take advantage of the VegTrug Grow Your Own Stage, hosted by BBC Radio 4 Gardeners’ Question Time expert Matt Biggs with guests including The Skinny Jean Gardener, Frances Tophill and Rob Smith. Photo credits: All garden plans are © of individual designers and sponsors.